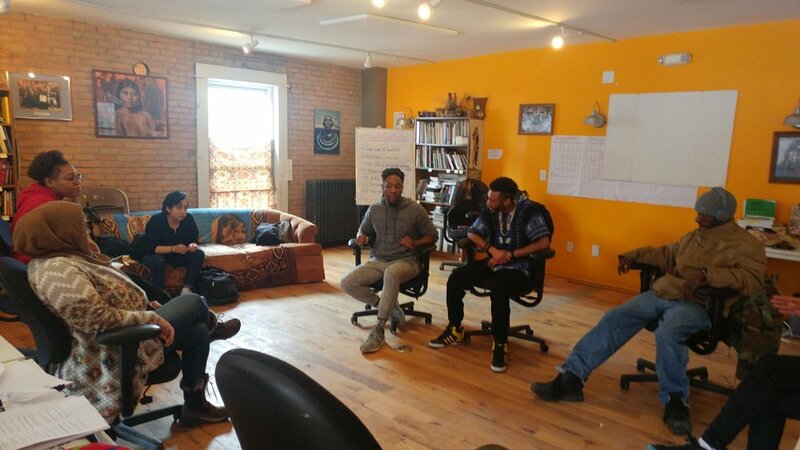 The Creative Hub offers a physical space for collective organizing and for linking theory and practice to begin reimagining leadership, collective civic engagement, and creative grassroots decision-making for cultural and systemic change. Grassroots community-builders unite to deepen relationships, share experiences, and learn and grow together through collaboration on projects across different issue areas including: food dignity, racial justice, indigenous rights, immigration, housing, LGBTQI+, cultural & political education, community engagement, and more! Did you know that 2016-17 Fellows implemented the Peoples Budget (PB) as a City process!? See details of the current work during the 2018 pilot year. Questions? pbithaca@gmail.com. Youth Organizing Fellows preparing for their meeting with Mayor Svante Myrick outside City Hall, 2017. Youth Facilitators: Anacheliz Gonzalez, Umeek Adams, Viola Jones. MRC partners with various community organizations, groups, and individuals to organize locally and connecting the dots to national and international issues that plague our communities. We kicked off the 2018 year with organizing efforts that address relationship building, solidarity, and action while also aligning with the 50th anniversary of the Poor People's Campaign through the MLK Day of Celebration event. We brought back popular education classes, ranging from food injustice, immigration, non-violent civil disobedience, LGBTQ+, housing, transportation, and many more issues. We had over 400 people attend the event. in many of the classrooms, there were people crowded inside and standing in doorways. To make the classes more accessible, children's activities were hosted at the Greater Ithaca Activities Center. Check out gallery from event below!